The Guild sponsors two award programs: the Paul Freeman Awards and the Twentieth Anniversary Awards. The Paul Freeman Award is presented annually to four members in honor of outstanding service to the Guild during the previous year. The entire membership is eligible to nominate fellow members and vote for the winners. 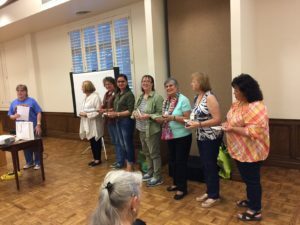 Nominations are taken in writing from the entire membership at the February meeting; voting takes place by written ballot at the April meeting and the awards are presented formally at the May meeting. The four winners get to display a select piece of framed calligraphic artwork in their homes for a year. The pieces are returned to the Awards and Memorials Chair in April of the following year for presentation to the next year’s winners. Four pieces of calligraphic art now constitute the Paul Freeman Awards. In 1979, Paul Freeman came to SACG from New York to teach the first “major” Guild-sponsored workshop. He proved to be a knowledgeable, sharing teacher who is forever in the hearts of the Guild members who knew him. Paul generously donated a demonstration piece titled “ABCdarian”, which the Guild framed. A second piece of Paul’s work, “New Spencerian”, was donated by Jim Hosford, former White House calligrapher. Along with these two pieces, the Guild now owns a framed print by Denis Brown, and a third piece by Paul Freeman that was donated by Eleanor Russell in 2006. It is an honor to be nominated for this award. SACG is fortunate to have so many dedicated members who contribute so much time and talent to benefit the Guild. 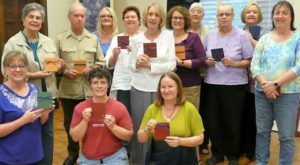 In recognition of that, it has become a tradition for a group of volunteers to also make a personalized gift that is presented to each nominee as he or she is announced. 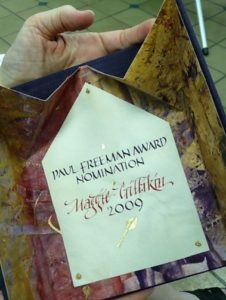 To nominate someone for the 2018 Paul Freeman Awards, please fill out this form; 2019 Paul Freeman Award Nomination, and turn in no later than the February Meeting! 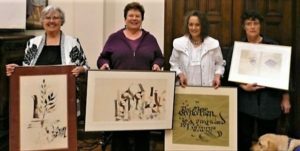 Five framed pieces of calligraphic work were donated to the Guild at the 1996 Twentieth Anniversary celebration. The Twentieth Anniversary awards are awarded each year to those four members who are currently serving as officers of the Board of Directors (President, Vice President, Secretary, and Treasurer) and to the Past President. The framed pieces are: “A Flower Alphabet”, by Victoria Pittman; “Nativity Angel”, by Larry Brady; “A Hugo Quote”, by Marsha Brady; “On February Fourteenth”, by David Howells; and “The Single Rose”, by Victoria Pittman. These awards are presented at the June Installation of Officers and returned to the Guild at the end of the person’s term in office.